If you were at Comic Con we’d love to see pics of your visit, especially if you showed off your cosplay talents! Or maybe you got some great snaps of your favourite Doctor Who stars that you KNOW you should let the world see! Either way, if you have Comic Con photos you’re happy for us to share online, get them to us! You can tweet your pics to us using @bbcdoctorwho or email us at thedoctor@bbc.co.uk. Also, if you met any of the Doctor Who team who attended San Diego Comic Con we’d love to hear from you! 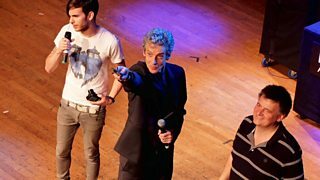 Did you share a few words with Peter Capaldi, get a selfie with Jenna Coleman or maybe meet Missy herself, Michelle Gomez? If so, tell us your tale! Did you enjoy the con? What did you think of the panel? And if you didn’t make it to the States, let us know what you thought of the new trailer! And be honest, how many times have you watched it, paused it and scrutinised the best bits? Don’t forget, you can tweet us or simply email the team here at thedoctor@bbc.co.uk. Big thanks for all your stories, pics and opinions! Squees, Feels and OMGs: Your Reactions to the Series 9 Trailer! This Week on Who… The Series 9 Trailer, the Daleks and San Diego Comic-Con!